The daybreak above Dodger Stadium on the morning of April 10, 1962 marked the dawn of a new era in Major League Baseball and Southern California sports history. After an exhaustive construction process and a longer period of anticipation that stretched back to the Dodgers’ original arrival in Los Angeles in 1958, the team was finally going to play a home game in its own ballpark. “It seems only a few yesterdays in the past that the glamorous, fantastic, romantic, and at times almost unbelievable Dodgers streamed across the country and thereby transformed themselves from the Brooklyn Dodgers of baseball history into the Los Angeles Dodgers. 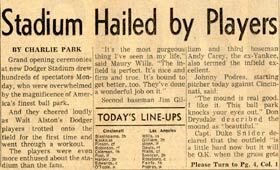 The headline in the Los Angeles Times sports section on April 10 was “PALMER RALLIES TO WIN MASTERS GOLF.” But right below was the headline “At Last It’s Play Ball in Chavez Ravine Today!” along with a picture of starting pitchers Don Drysdale, Sandy Koufax and Johnny Podres from the previous day’s workout. 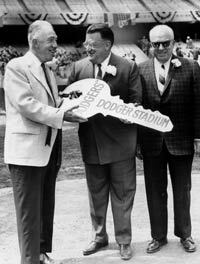 There was also a photo of Baseball Commissioner Ford C. Frick handing an oversized key to Dodger Stadium to Dodger President Walter O’Malley as National League President Warren Giles looked on. Batting practice had to be called off when no one could find a backstop, so O’Malley called instead for infield practice. The players, coaches and estimated 5,000 fans in the grandstands enjoyed the sneak preview of the new Dodger Stadium. During the public dedication ceremonies, broadcaster Vin Scully raved about the acoustics as the stadium’s public address system was in stereo. The system was installed by a West German company using plans from the same engineer who designed the acoustical system in the La Scala Opera House in Milan. In addition to the Dodger Stadium opening, the morning sports pages looked to the East Coast as the New York Yankees’ “M&M Boys,” Mickey Mantle and Roger Maris, took aim on another home run derby after they combined for 115 home runs (Maris 61; Mantle 54) during the expanded 162-game schedule in 1961. The newspapers planned to carry a daily box with comparisons to Babe Ruth’s 60 home runs during a 154-game schedule in 1927. And the Times sports section display ads touted the Ben Rudnick Tire Co. on South Flower Street in Los Angeles, which offered B.F. Goodrich white tubeless tires for $13.95, plus tax. Martin Leasing on Sunset Blvd. featured monthly deals on new model cars ranging from $169.50 for a Continental to $82.60 for an Impala. Manager Fred Hutchinson’s Cincinnati Reds, flying in from Ohio by chartered DC-6, didn’t get to bed at the Sheraton West until nearly 3 a.m., which didn’t leave much time for sleep until their 8:30 wakeup call. The Reds tabbed Purkey, a knuckleball pitcher, as an emergency starter for staff ace Jim O’Toole, who suffered a freak injury upon his arrival to Los Angeles. The left-hander split a nail on the middle finger of his pitching hand while handling his luggage on Sunday night. The Dodgers’ Duke Snider nearly missed the game with an unusual injury of his own. On his way to Monday’s workout, the tailpipe on his car fell off. Forgetting the pipe was hot, Snider picked it up and burned his fingers. He taped the fingers and wore a protective golf glove. To avoid traffic congestion, the Dodgers opened the ballpark early at 10 a.m. Johnny Boudreau’s band and Dodger organist Bob Mitchell entertained the early stadium arrivals while outside 100 parking lot directors worked to keep traffic moving in the parking lot while extra police were hired to help the flow outside with the late-arriving lunch hour crowd. Stadium workers painted the outfield grass with a vegetable dye, which turned the baseballs a shade of green during batting practice. The Reds were impressed as they surveyed their surroundings Tuesday morning. Renowned tenor Alma Pedroza sang the national anthem at 12:45 p.m. after the coaches and players were introduced from home plate. At 1 p.m., Kay O’Malley threw out the ceremonial first pitch to catcher John Roseboro. The honor was a “two day early” birthday present from her husband. Kasko climbed into the batter’s box and took the first pitch from Podres. It was called a ball by Hall of Fame umpire Al Barlick, who nearly missed the honor of working behind the plate. His equipment, which had been air expressed to the stadium, couldn’t be located until a few minutes before game time. Kasko opened the game with a double into the left field corner and scored on Pinson’s one-out single. In the second inning, fans in the Left Field Pavilion unfurled a streamer reading “Fallbrook City Limits” in honor of the Dodger captain. Snider lined a single to right field, the first hit by a Dodger. The Dodgers took a 2-1 lead in the fourth inning on Fairly’s two-run double, which scored Gilliam and Snider. Cincinnati evened the score in the fifth on Harper’s RBI single. With two out in the seventh, Pinson stroked his third hit of the game, a double. The Dodgers intentionally walked Robinson to face Post, who hit Podres’ first pitch over the center field fence for a 5-2 lead. The afternoon edition of the Herald-Examiner was printed with Cincinnati leading 5-2 in the ninth inning. “HOME RUN FOR CINCY” blared the headline on page A-1, just above a large photo taken from the right field corner of the upper Reserved Level. 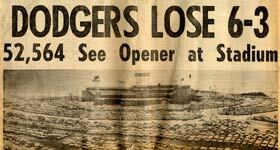 “REDLEGS CHASE PODRES” exclaimed the sports section, which featured an aerial photo of the stadium by Harold Morby in the KTLA-LA telecopter piloted by Larry Scheer. The Dodgers chased Purkey in the eighth inning and loaded the bases with one out but pinch-hitter Tommy Davis, batting for Snider, hit into a double play. Another rally in the ninth inning fizzled and the Reds christened the new ballpark with a 6-3 victory in front of 52,564. The majority of the postgame comments revolved around the ballpark and not the actual game. Purkey and Snider revealed how the background of white shirts formed by the patrons in the dugout box seats made it difficult to pick up the ball from the batter’s box. Fairly, who attended the University of Southern California, reflected on the first game at Dodger Stadium in which his two-run double could have made him the hometown hero. “I’d feel all right if that hit had won the game,” Fairly said. “I thought I hit a slider. The fellows on the bench said it was a knuckler. Frankly, I don’t know what I hit. All I know is that the ball had Warren Giles and Spaulding on it. I saw it real plain. Walter O’Malley’s Executive Box ticket for the Grand Opening of Dodger Stadium on April 10, 1962. 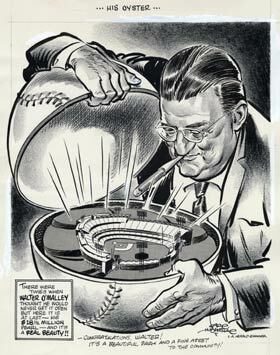 Artist Karl Hubenthal saluted the beauty of Walter O’Malley’s Dodger Stadium “pearl” as the Dodger President opened a baseball-shaped oyster.Copyright by Karl Hubenthal - All Rights Reserved. You are not allowed to cut and paste or use the Hubenthal Cartoons on this site without the expressed consent and approval of the Karl Hubenthal Family Estate. 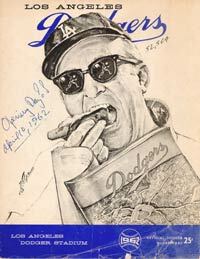 The Dodger Stadium program from Opening Day 1962. The cover sketch is a self-portrait by artist Nicolas Volpe.Copyright © Los Angeles Dodgers, Inc.
A full house at Dodger Stadium watched left-hander Johnny Podres start the first game in Walter O’Malley’s new ballpark.Copyright © Los Angeles Dodgers, Inc.
Peter O’Malley looks on as his mother Kay gets ready to throw out the ceremonial first pitch from behind the Dodger dugout in the Field Level seats. 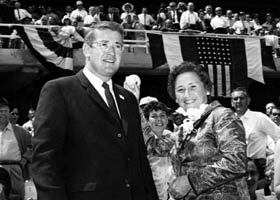 The Dodgers’ first opponent in their new ballpark in 1962 was Manager Fred Hutchinson’s Cincinnati Reds, the defending National League champions. 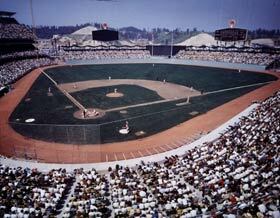 Dodger Stadium received positive reviews from both the Dodgers and Reds on Opening Day 1962. Eddie Kasko’s leadoff double off Johnny Podres in the first inning christened the new ballpark. 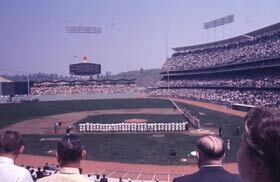 The view from the right-field corner of the Reserved Level provided a postcard view of a packed Dodger Stadium. 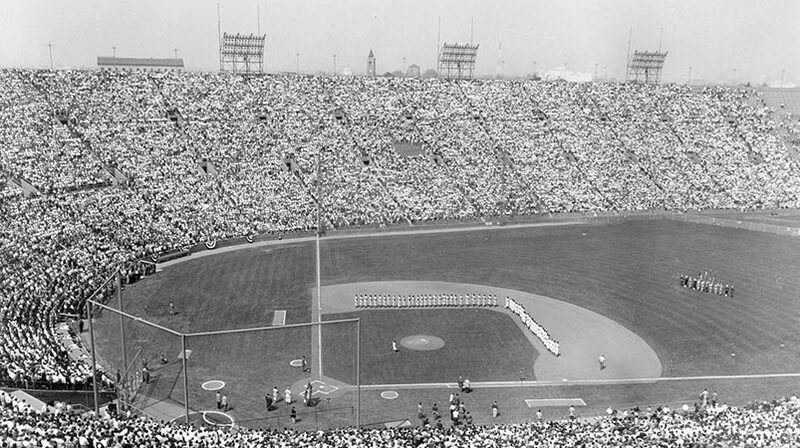 The parking lots were filled to capacity for the historic first game at Dodger Stadium.